The British Crown Prosecution Service has charged Russian businessman Andrei Lugovoi with the murder of Alexandr Litvinenko. The question if anything will come of it. First off is a major legal hurdle. Article 61 of the Russian Constitution bars extradition of Russian citizens. It states, “a citizen of the Russian Federation may not be deported out of Russia or extradited to another state.” And this is the line the Russian government is taking. Marina Gridneva, a spokeswoman for the Russian Prosecutor-General’s Office, told RFE/RL, “A citizen who has committed a crime on the territory of a foreign country can be prosecuted on the basis of materials provided by that country, but only in Russia, if there is an analogous crime punishable under Russian legislation.” So it might come down to how much Britain is willing to make a diplomatic issue out of Litvinenko’s murder. One carrot they might dangle in front of the Russians is the extradition of Boris Berezovsky and Chechen exiled leader Akhmed Zakayev. But that also might cost Britain too much politically. The fact that the UK granted Berezovsky and Zakayev political asylum prevents any extradition. Last June a British court ruled that Berezovsky “was protected by the Geneva Conventions which say that no individual can be extradited if he has been given political asylum.” I guess if things get to hot for Berezovsky he can beg the Israelis for his citizenship back. He held Israeli citizenship from 1993 to 1996. He had to renounce it when he became Deputy Secretary of the Russian Security Council. 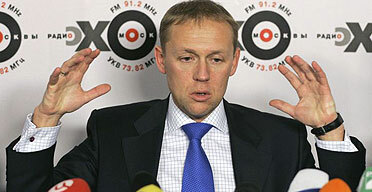 Lugovoi had the following to say in response to the charges: “I believe the decision is a political one – I did not kill Litvinenko, have no connections with his death, and I have grounds in expressing my distrust of evidence collected by British law enforcers.” He then added that we will be hearing more from Mr. Lugovoi in the coming weeks. He vowed to make several public announcements “which will be a sensation for public opinion in Britain and will fundamentally change assessments of certain events, which have been surrounding some persons of Russian origin in Britain in recent years.” Those Hollywood script writers working feverishly on the Alexandr Litvinenko movie better put down their pens and hold on the brainstorming sessions. (I suggest just move your energies over to the Anna Politkovskaya movie boys. That case seems to be going nowhere.) To think we thought the drama was over. It’s only just beginning. Could it be that Litvinenko, the much applauded “fierce critic of President Vladimir Putin” (So fierce that curiously no one had heard of him until his demise) was really just bungling terrorist who fell victim to his own nefarious plot? Boy, wouldn’t that be a riot. The real question is how many points on the Amazon Sales Rank Blowing Up Russia: The Secret Plot to Bring Back KGB Terror will shoot up as a result of all this. I know one thing. If I didn’t have to ever see that damn photo of Litvinenko lying in that hospital bed looking like a cancer kid again, it wouldn’t be too soon. Surely news agencies have better stock photos than that. A shout out to UK Daily Pundit, Copydude, and Strata-Sphere for the links.